These days, in our world of instant gratification (we may even be able to leverage our selfies to make purchases1), it’s more necessary than ever to be able to stay focused on saving money any way you can. Have a weekly money date. Commit to sitting down with your money once a week for a money date. During this time, update your budget, review your accounts and track your progress against your financial goals. Like any relationship, if you want your financial life to improve, you must spend time with your money. Taking a few hours every weekend to grocery shop and meal plan for the week will definitely save you money, as dining out is the No. 1 expense for most households. By eating at home, you save money that would otherwise be spent on tax and tip–and you usually save calories, too. Gasp! Cut out TV?! Never! But with services like Hulu, Netflix and Amazon Prime, you can now watch your favorite TV shows and movies for a fraction of the cost of cable TV. A study by NPD shows that cable bills will soon grow to an average of $123 per month, or $1,476 per year.2 By switching over to an online service or cutting out TV altogether, you can save that money for another financial goal–like paying off debt, traveling or saving for a home down payment. If you love working out, Class Pass is the way to go. By paying a membership fee of $99 per month, you can attend all sorts of classes in your neighborhood–cycling, yoga, Pilates, barre, strength training, bootcamp, dance and more. This beats having to pay for each studio’s monthly membership or individual class fee, which can add up to hundreds of dollars a month. The more friends you have, the more money you spend on lunch dates, birthday parties and gifts. Switch it up and instead of meeting over a fancy dinner, host a potluck and have everyone bring his or her favorite dish. That way you can save money you’d spend on restaurant extras like tax, tip and parking–and you’ll usually have a more intimate meal together, too. Finding a place to stay while traveling is so convenient when you use Airbnb. You can often find a place that has a kitchen (so you can cook meals at home to save money) at a rate that’s comparable to hotels. You can even rent out your own place on Airbnb while you travel to make some extra cash to pay for your own travel expenses. It’s a win-win scenario. This one’s not my favorite, as I absolutely love going to coffee shops and drinking organic, delicious coffee. However, spending $4 to $5 on coffee every day definitely adds up. So try my approach and allow yourself a few days a week to buy coffee at cafes, and make it at home the rest of the time. When you’re working a lot, there’s not much time left to shop and spend money. Stay busy and pursue a career you love–then watch how when you’re busy hustling, you spend less. Since we can have anything we want these days with just the click of a button (there’s that instant gratification again! ), you need to find a system to help buffer your impulse purchases. Example: Wait 48 hours before spending money on things that cost more than a certain amount. When you do, you will find most of the time the item was more of a “want” than a “need.” Plus, you’ll save money and work toward being more mindful with your spending. Use blogs and Pinterest to learn DIY beauty treatments. Self-care is important–but going to spas and getting pedicures, massages, etc. can really add up. Allow yourself a certain amount to spend on these things, then use blogs and Pinterest to find at-home beauty treatments to help you save money. Often you can find a DIY, organic option using common household or kitchen products. Outsource with Fivrr or Task Rabbit. Time is a commodity, and your time is precious and valuable. And these days, there are so many tasks you can outsource that will save you time and money. But how do you figure out if outsourcing something is worth the expense? A great thing to do is to actually calculate the cost of your time, which will help you figure out if you can pay someone to do something for less than your hourly rate. Here’s an example: A monthly net income of $3,000 divided by a total of 160 hours worked equals an hourly rate of $16.75. Now that you know the value of your time, you can strategically outsource it, using a service like Fivrr or Task Rabbit, for a fraction of your hourly rate. Find creative ways to express your love to friends and family members for birthday and holiday gifts. After all, a handwritten note explaining why you love someone can be more sentimental than some expensive gift he or she may never even use. Most people will appreciate the thought behind your gifts more than anything, so don’t be afraid to save money and find free ways to celebrate birthdays and holidays. This can apply to food, clothes, electronics and much more. Although it’s tempting to choose the more budget-friendly version of an item, sometimes choosing quality over quantity will save you more in the long run. Save up your money and get the best-quality product you can afford, and leverage the cost-per-wear philosophy with more expensive clothing and shoes. This applies to food, too: Buying quality organic food can nourish you in ways that fill you up more than the pre-packaged, processed stuff and potentially save you health care costs in the future, since you’re taking good care of yourself. Find a balance that is right for you and choose quality whenever you can. A lot of times excessive spending is a way to avoid feeling certain emotions. If you check in with yourself before you go on a major spending spree, you may be able to identify if you’re feeling bored, lonely or stressed and spending money as a way to avoid the underlying emotion. Check in before you buy and be mindful with your spending. Stop trying to keep up with the Kardashians. It’s hard to keep your blinders on and not compare your financial life to others’, especially celebrities. However, it is really important to be clear about what matters most to you and make sure you build a financial plan that supports that vision. This will keep you moving toward your financial goals and stop you from spending money on things you don’t need to impress people you don’t like. When you learn about personal finance, you’ll learn even more strategies to help you save money for your goals in life. Knowledge is power and the more you know, the more you can save. Balance out your “YOLO” mindset. With social media controlling our lives like never before, people often fall victim to the “fear of missing out” phenomenon and instead go overboard with a “you only live once” mentality. While it is important to live in the present and soak up each precious moment of life, make sure you balance that out by saving for your financial future, too. Without checks and balances in place, you can find yourself saying yes to everything and spending more money than you have–all because of the fear of missing out. Be very specific with your financial goals. For example, saying, “I want to save for a home down payment” is not enough. You need to map out how much you need, by when, and what you need to save every month in order to reach the goal. When you know what your targets are, you’re more likely to stay the course and continue saving for them for the long-term. Staying focused on your goals take discipline and determination. Saving can be easy and exciting at first, but after a while you may lose that initial motivation and start to find other things you can spend that money on. To avoid veering off course, check in with your goals regularly and keep your eye on the prize. There are many discount supply companies you can use to save on household supplies. Even using Amazon.com to order your soap, detergent, cleaning supplies, etc. can be more cost-effective–and save you the trip to the store, too. And if you have Amazon Prime (which has an annual membership fee), you can order products and have them shipped to your house for free. If you have the room, buy in bulk as much as you can to save more money. This drives the cost per unit down. With Uber now available in the majority of U.S. cities, many people are opting out of having a car altogether and choosing to Uber instead. If this is an option you might like to consider, calculate the total annual cost of owning a car–monthly payment, gas, maintenance, repairs, insurance, etc.–and compare that against the total projected amount you would pay to use Uber full time. If you’re okay with not owning a car of your own, this is a viable option to save money. The best way to save is to have your savings automated and allocated toward your various financial goals/accounts. This allows you to think of your savings like a bill, which means you’ll save before you spend money on everything else for the month. Give your savings account specific names. Naming your savings accounts something specific, like Cash Cushion, Travel, Wedding, Home Down Payment, etc., allows you to feel more connected to the goal. When you are emotionally invested in that goal, it is easier to stay motivated to continue savings toward it. Having a financial buddy to be there to support you in your savings goals and cheer you on is key. The path can get difficult, and having someone to share the journey with makes it more fun and allows you to get back on track when life happens. People in the U.S. save only 5.5% of their money compared to the 20% that personal finance teaches that you should put away. But instead of feeling ashamed about your lack of savings, just start by saving something. Even 1% is better than nothing. Track your progress and continue to increase the number year after year. Step by step, day by day, you can get to that 20% savings level. Speaking of tracking your progress, make sure to take time out to celebrate every little win in your financial life. So many times, people reach a financial goal, like paying off debts, only to feel burdened by the next one. Focus on the positive and take time to celebrate the mini-wins along your financial journey. Log your expenses every day. If you’re having trouble finding money to save, keep a spending diary for a month and log every single purchase you make. By having to report your purchases every day, you train your mind to think twice before swiping the card or handing over your hard-earned cash. It may seem tedious, but this kind of tracking can help you identify spending vices and cut out any waste in your budget. Going on a cash diet can also help you cut out the waste in your spending and allow for more savings. Since most people use cards or online services like PayPal to make purchases, the connection between earning and spending money becomes blurry. When you use cash, you realize how quickly your money can be spent if you don’t pay careful attention to it. Rent a car at Costco. Costco is a great place to buy in bulk, but it also has other services, like car rentals and eye exams, that are offered at a discount. Plan accordingly to maximize their deals. It may sound like a no-brainer, but how many times do you actually pause and check in before you spend money? Just one simple pause can help you save, as it will help you stop rushing and put you back in the present moment. The more mindful you are about spending, the more you can save. 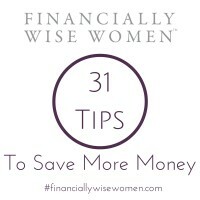 0 responses on "Featured Blog: 31 Ways to Save Money"